The era of the Lunatic Fringe began in spectacular fashion as Dean Ambrose stunned new champion Seth Rollins having won the Money in the Bank briefcase on the same night. Rollins himself had just beaten Reigns in the main event to recapture the belt he never lost, before Ambrose served sweet redemption. Also on the night, a dream matchup between AJ Styles and John Cena finally went down - although The Club would play spoiler, interfering to help Styles take the victory. Usual kick-off proceedings with a prescription of nonsense along with sprinklings of genuine action ensued prior to the main card, as fans filed in to the brand new T-Mobile Arena in Nevada. "Golden Truth" was indeed served as tag-team action was first to begin inside the squared circle, the duo of Goldust and R-Truth ousting the even more peculiarly named "Breezdango". Legitimacy comes in minimal amounts for a pay-per-view pre-show, but there was a plentiful supply when the Lucha Dragons scored a major victory over The Dudley Boyz. With the talent-stacked division opening several avenues, a chaotic ending of a Salida Del Sol and Dragon Bomb by Kalisto and Sin Cara respectively would cap off a solid bout. At the top of the hour, New Day would prevail from a fatal-four-way tag-team match to keep their Championship reign intact. They saw off The Club, Vaudevillians and Enzo Amore and Big Cass over the course of a riveting bout. The match saw The Club act as powerhouses, dominating most of the action, but the New Day had an equaliser in Big E, to restore the power balance and lead his team to victory. A collective sigh met the announcement of Baron Corbin and Dolph Ziggler's match, this time ending with a strong victory for the former NXT talent. Ziggler was again playing the smaller man to try and topple the larger Corbin, using his speed to try and outwit his opponent. An attempt to hit the air from the top rope was the beginning of the end for The Show-Off, as Baron landed the End of Days for the pin. With all the talent at their disposal, it's as if the Women's Division took a bit of a step back at Money in the Bank. A tag team match featuring the team of Charlotte and Dana Brooke, and Becky Lynch and Natalya was filled with the team of the Women's Champion taking control, using underhand tactics to gain an advantage. An unintended clattering between teammates Lynch and Natalya would give the opening for the opponents to win the bout - and soon after, Natalya attacked Lynch as an expression of her frustration. Many still remained uninterested in a match which failed to justify its booking. Apollo Crews scored a huge victory over Sheamus, taking all he could give him and responding with a roll-up pin to stun the former World Heavyweight Champion. 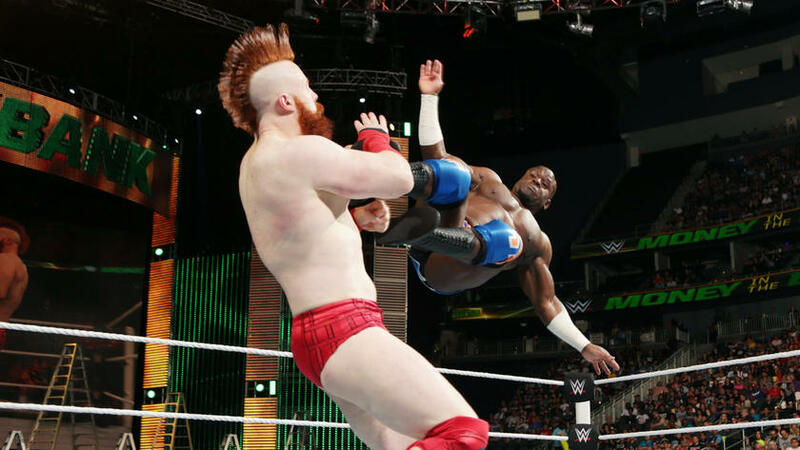 Apollo demonstrated plenty more of his skills while Sheamus' brutality attempted to disrupt his athletic flow. It seemed like the writing was on the wall when the Irishman landed a White Noise manoeuvre from the middle rope, but Crews managed to kick out. In shock and disbelief, Sheamus argued with the referee, providing just enough time for the roll-up pin. Rusev later on made a disappointing Fathers' Day for Titus O'Neil as he denied him of capturing the United States Championship after a physical match. He rubbed salt into the wounds by insulting his children who were ringside after. The Bulgarian Brute looks quite fearsome at this moment in time. John Cena and AJ Styles meeting inside a wrestling ring was a prospect that could only have been dreamed of until this year - but when they did, both would take each other's best, only for The Club to intervene and rob fans of a classic; as they helped AJ Styles to the win. An electric atmosphere in the fight capital of the world was only fitting of a dream match more than a decade in the making. It was a spectacle fitting of all superlatives which began with plenty of one-way traffic for AJ Styles. With the crowd split down the middle from "Let's go Cena" to "AJ Styles", the former TNA champion left his opponent rattled early on by controlling him with a headlock. The CeNation Leader did register an early attempt for the patented Attitude Adjustment, but the escape was a simplistic one, before Styles went on to out strike the 15-time world champion en route to gaining a dominant foothold on the bout. A bemused expression occupied the face of the WWE veteran, having been thrown into the deep-end after a lay off. His attempts to establish some sort of rhythm where thwarted time after time, as continuous spanners were thrown in the proverbial works. Cena would need to rely on a mistake to try and gain an advantage, and did so when some overzealous attempts sent Styles crashing to the turnbuckle and then the outside. Soon enough, it was the WWE newbie who was struggling to find his feet - since John Cena had one of them locked up in the STF in the centre of the ring. He would survive the submission, and soon attempted a forearm from the top rope, but was caught on the shoulders of Cena who's AA attempt was stuffed, before vicing a submission of his own with the lethal Calf Crusher. That created a bulls eye target for Styles to work on, as he picked apart the weakened area with subsequent leg kicks. Even on quaking boots, Cena managed to hit the Attitude Adjustment, but a kick out at 2 was met with a collective roar and gasp from the Vegas crowd. Soon after, Cena then kicked out of the Styles Clash, as both wondered what would be enough to put their opponent away. Ultimately, it would be the involvement of outside instruments, a certain "Club", to sway the contest. AJ Styles attempted a Pele Kick after landing on his feet from the AA, but that too was dodged by Cena who hoisted his opponent back on his shoulders for another AA attempt, but off balance, he went towards the referee who was taken out. The feet of Styles landed flush on the official, sending him rolling out of the ring, while the AA was landed. A pinfall did last for more than the 3 count, but with no official to determine this, nothing was settled. Then, with no one to disqualify them, The Club surged down to the ring, attacked Cena and finished him off, before putting the lifeless AJ Styles on top, and the referee gingerly got back into the ring to count 3, as AJ Styles scored a controversial victory over John Cena. There's two sides to the coin following that; one is the obvious negatives that this match was building to go down as a classic and it ends like that. Second is clear - we will be seeing this match again. The Club's involvement puts Styles in a puzzling limbo which should hopefully be ironed out in the future. For the snippets of what we saw though, there's so many reasons why Cena vs. Styles was so highly anticipated. On one night, Dean Ambrose won a gruelling Money in the Bank ladder match before cashing in on new world champion Seth Rollins who himself had wrestled the belt from Roman Reigns moments before. Six of the best midcard stars made for a compelling ladder contest; as action flowed all over the ring from Cesaro uppercuts to Zayn back breakers and beyond. When the ladders were introduced, things would only become a lot more painful, first with Ambrose being planted on the steel by Chris Jericho. Y2J would then meet the ladder face first at the hands of Del Rio. Las Vegas soon turned into Uppercut City as Cesaro threw uppercuts all over the place with opponents mounted in the corners. He then ran into a superkick from Owens, before a series of ladder run ins with everyone coming close - but not close enough. Cesaro was in agony at the top with Del Rio locking in a cross-arm breaker, after the Mexican Aristocrat had delivered Inziguri's all over the ring. Owens kicked Del Rio off, before a now-freed Cesaro leaped off the ladder and onto the ropes for an unbelievable springboard uppercut. The degree of danger would then increase when all six competitors were on a set up of ladders inside the ring. Eventually, they would all go down, and a series of further falls would end with two men duelling: Ambrose and Owens. Dean would knock KO off eventually and then grab the briefcase, putting him in line for an instant shot at the gold. Roman Reigns was fuelled by anger and used his power to gain some early leverage, while the former champion tried to equalise by improved speed and grappling throwing up a few problems. At any time though, the Powerhoues was able to demonstrate his match-changing power, as was the case with a Samoan Drop after Rollins came off the ropes. He then landed a thunderous powerbomb showing every intention to walk away still the champion. Any potential issues with the injured knee were quickly debunked when Rollins flew to the outside after taking a Superman Punch, jumping over the top rope with a forwards dive. Attempts of the Pedigree were reversed, and Rollins then survived another Superman Punch, before again the tide turned and a Frogsplash from the top rope was denied by Reigns. Confidence was beginning to increase for the Architect, as he landed the power-bomb in which his knee gave out for the injury last year. A superplex and Falcon Arrow subsequently were all kicked out of, and then medical attention was needed for Reigns after he crashed into the barricade; with Rollins getting out of the way in time as the fight spilled to the outside. Despite medics checking up on the reigning champion, Rollins went straight after him, bringing him back into the ring to attempt the Pedigree. Reigns pushed him away into the referee, grounding him, but then landing a Spear on Rollins for a pin which lasted the 3 count. Unfortunately for him, there was no one to count that 3, and when going for another one, it would be reversed into a modified pedigree. A marginal kickout with official Mike Chioda back to consciousness would be Reigns' last stand, as a final Pedigree finished him off, Rollins pinned Reigns clean. But not even a minute into the title reign and Ambrose would show up, attacking his nemesis from behind, and subsequently cashing in with the Dirty Deeds, finally getting his hands on WWE gold. The Ambrose Era is upon us.